This idea came from Nan of Letters from a Hill Farm, who got the idea from another blogger, and so on: Once again, this fun meme is great for the end of the year. Take the first line of each month's post over the past year and see what it tells you about your blogging year. It's an interesting way (more interesting to me than to you, I suspect) of looking back to see where the blog has wandered from January to December. 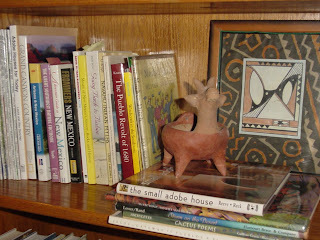 In the case of The Zees, there have been book reviews, memories about younger years, a little homesickness for New England, some spring decorating around the house, art by our own Auntie Bucksnort, explorations around New Mexico and research into its history, and a lot of raving about the wonders of adobe and our home-to-be in Las Cruces. If you are a blogger, you might give this meme a try. I hope you'll let us know if you do so, via the comments below. As the minutes pass, it feels to me like we are collectively pulling the [new] year...toward us. From Eat, Pray, Love, by Elizabeth Gilbert. I once took an undergraduate class in logic from a Catholic priest. When I was first married, my brilliant new husband teased me about making what he called Heatherstone curtains--referring to my family’s home on Heatherstone Drive and my mother’s love of decorating (and re-decorating). ...It's 72 degrees outside and the weather channel tells you that it's fixin' to blizzard in a couple of hours. And it does. I thought I'd share a couple more pieces of art done by our own Auntie Bucksnort, since she isn't likely to show you any (challenge, Auntie!) over on her blog. A word about the fibers that I use: This is as good a time as any to admit that I am no longer the fiber snob I started out to be. [Pecos] was the gateway for Pueblo Indians when they went buffalo hunting on the Plains; a two-way pass for barter and war between Pueblos and Plains tribes; a portal through the mountains for Spanish explorers, traders, and buffalo hunters; for the St. Louis caravan traders with Santa Fe; for pioneer Anglo American settlers; for Spanish and Saxon Indian fighters; for Civil War armies; and for a transcontinental railroad passing through the Southwest. The good news today is that you get a big laugh--and an even bigger laugh if you've owned sheep and have tried to move them where you want them to go. 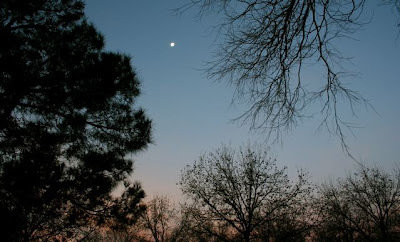 I was out early the other morning admiring this sliver of moon next to Venus. [On a video of an “extraordinary musical instrument”]:Update, 12/5/09: A musical friend pointed out the improbability of this "instrument," and, sure enough, he was right. Dogs aren't allowed on the trails; if these are from a coyote, he's a big one! 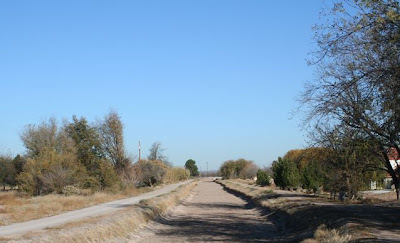 At the Mesilla Valley Bosque State Park, you will see coots, mallards, gadwalls in the water and roadrunners along the edges of the ditches; northern harriers, great blue herons, and egrets cruising over the open areas; and Gambel's quail, crissal thrashers, and the cardinal-like pyrrhuloxia year-round out in the desert areas. Whose are these? Do you know? 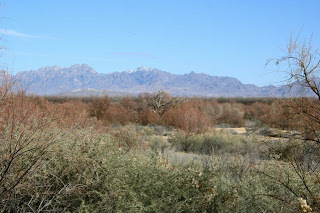 There are mule deer, beaver, rabbits, javelinas, bobcats, and coyotes as well. 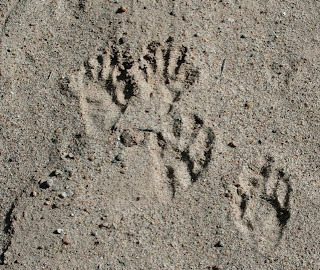 Although we haven't actually seen any of these "in person" yet, there are lots and lots of tracks to be seen along the water's edge. 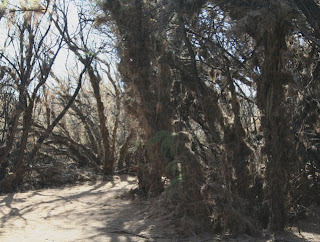 We puzzle over them and try to guess at the dramas that have been played out, but we really need to learn more about the habitats of the bosque and those who live in them. 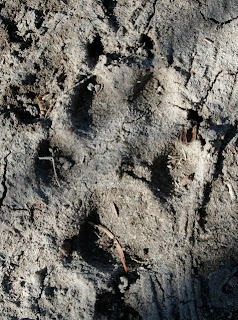 We are pleased that the park will be offering a basic animal tracking seminar in a few weeks. 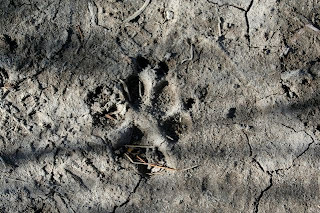 (Basic Animal Tracking, Saturday, Jan. 23rd at 8 AM). This workshop is free to the public with a valid park pass ($5.00 per vehicle) and we plan to attend. We hope to learn to identify the tracks of the animals we see, because we really have no idea what we're looking at right now! 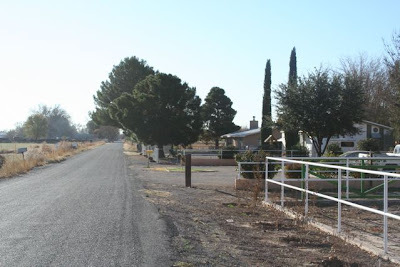 The Mesilla Valley Bosque State Park, located just south of Las Cruces, New Mexico, follows the Rio Grande for three miles and contains 300 acres along the river and an additional 600 acres of desert land. 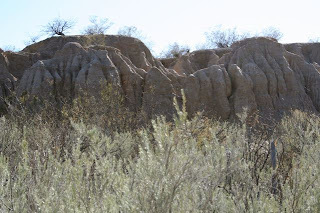 Within the park there are so many habitats--river, irrigation canals, marshes, floodplains, sandy desert, eroded cliffs, riverside woodlands, and restored wetlands. 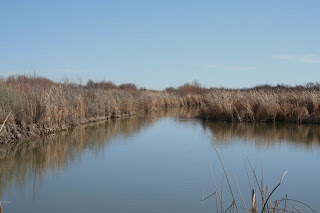 Here are some of the habitats we saw on our recent visit. 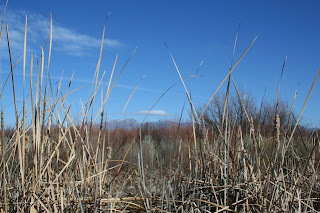 We went for a walk at the Mesilla Valley Bosque State Park a couple of weeks ago. 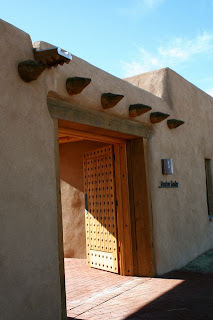 It is New Mexico's 34th state park and has just observed its first anniversary. 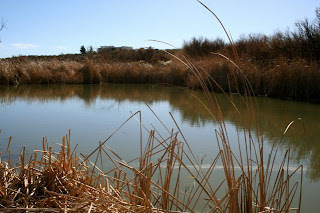 Living in the Chihuahuan Desert as we do, it's a real treat for us to be able to wander through such a watery environment. 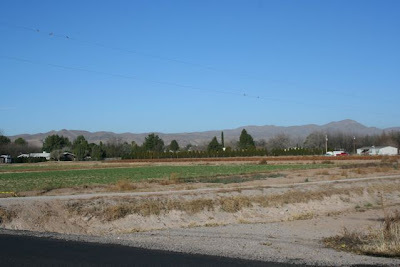 The bosque (pronunciation is here), or riverside forest, is just minutes from the center of Las Cruces, but you might think you are miles and miles away, enjoying the peace, looking up at the mountains, and seeing signs of the bird and mammal residents all around you. I will be posting some more photos of those signs over the next couple of days. 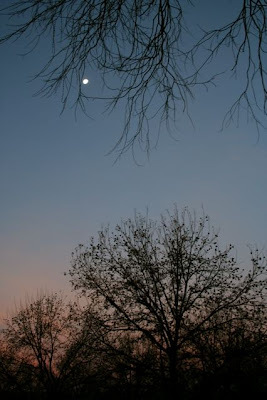 Here is a December moon rising over the pecan orchard next door, just in time for Skywatch. For skies from all over the world, taken at all times of the day and night, please visit Skywatch Friday. 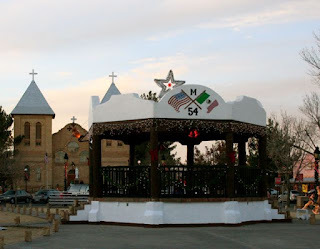 The village of Mesilla, New Mexico was incorporated in 1848 and has a population of just over 2100. 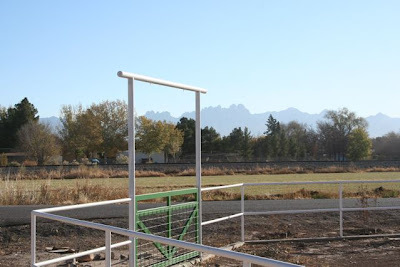 It is located just south of Las Cruces and is a popular spot for visitors and Las Crucens alike. Sitting out on the plaza surrounded by the old buildings takes you back to another time and place. It is especially beautiful at Christmas time, when the walks are lined with luminarias, the little bags containing candles that are called farolitos in the northern part of the state. Now that we live in an area of pecan orchards--our property is surrounded by someone else's pecan trees--we are learning about how pecans are grown and harvested. In some big commercial orchards, there are fences all around to discourage human trespassers, and propane cannons go off at intervals to scare off ravens who might otherwise enjoy some free pecan meals. 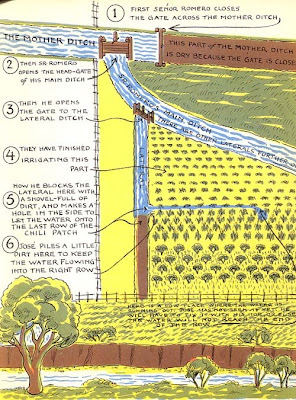 In our neighborhood, the orchards are much smaller and unfenced. The trees around us hang over our fence, so we find handfuls of pecan hulls in our yard, just there for the picking. We strip off the hulls and bring in the pecans to age a bit before cracking them. We've been watching our neighbor across the street to see how he deals with his dozen or so pecan trees. First, he raked up all the fallen leaves in the yard, leaving them in rows along the fence line. 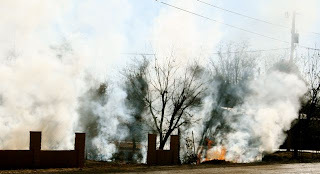 Then, to our surprise, one clear and calm afternoon he sprayed the piles with kerosene and set them all on fire. The low fires didn't seem to hurt the trees, gave his grandchildren a great deal to be excited about, and were soon out, leaving clean ground behind and all ready for the next step. This morning, a group of strong young men arrived and began beating the tree branches with long poles. Now they are crawling along the ground (how I admire their knees!) and gathering the nuts by hand. In larger orchards, large machines that shake the trees are used. I hope to get photos of that happening soon. 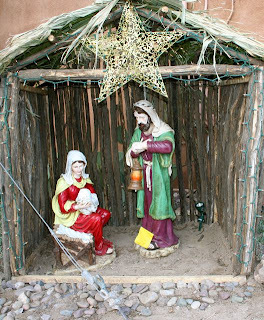 Here's a nice article in this morning's Las Cruces Sun-News about Christmas celebrations in our part of the world: Don't Miss the Christmas Miracle in Our Own Backyard. 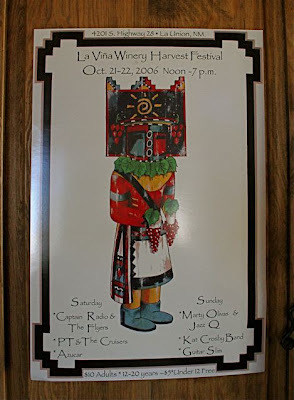 The last time we visited La Viña Winery it was for a wine tasting and jazz festival, back in 1998. 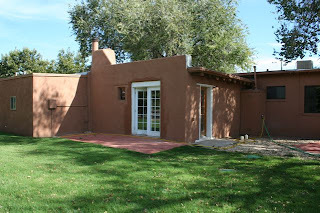 After an afternoon spent tasting and listening and watching little kids dance spontaneously in the hot New Mexican sun, we bought some wine from where it was being sold at the time, out of the vineyard owner's little garage. We brought home our wine glasses, the bottles of wine, and a poster. It was a great experience, and we were always reminded of it when passing the framed poster on the wall of our New Hampshire house, or when drinking from our cool little La Viña wine glasses. A lot has changed in the past ten years. We have gotten older (of course! 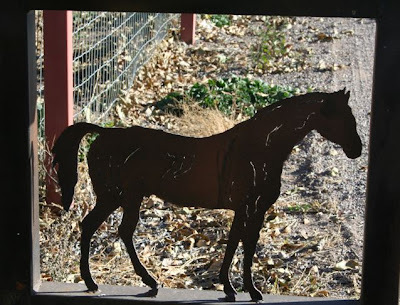 ), I am retired and Beez is getting close to his own retirement, and we have have moved from New Hampshire back to New Mexico. We took Auntie Bucksnort for a ride the other day, down to the little vineyard we remembered so well. Wow! A lot has changed at the vineyard, too! 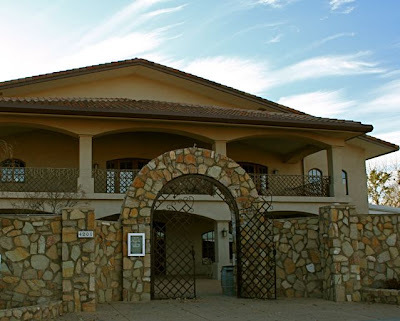 In place of the little garage, there was a big villa-like building with a lovely patio and a beautiful tasting room. We tasted, we bought, and we came away with posters and wine glasses, just as before. 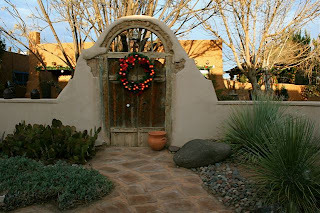 The charming hostess, who was a little homesick for her native Chile, explained that the owners had worked tirelessly for the last 20 years with little time off to make the vineyard what it is today--New Mexico's oldest winery, producing some of New Mexico's finest wines. We plan to go back for the next Blues and Jazz Festival in April, for sure, but what really sounds charming to me is the Music on the Patio series. 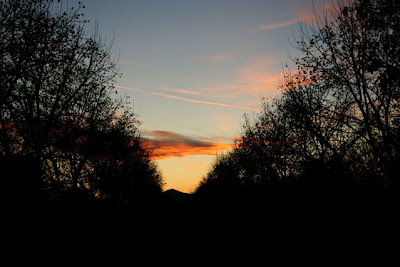 From April to November you can bring a picnic of your own and enjoy a free concert on the patio, while drinking some delicious La Viña wine, meeting a few new friends, perhaps, and gazing out at the wonderful mountain view. It sounds very civilized to me. Won't you come along, too? 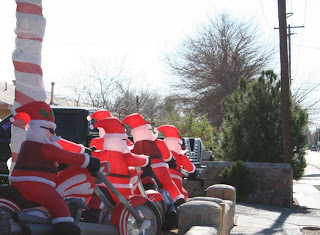 We were all packed up and ready to leave Clovis, New Mexico for the last time. On the very last evening the sunset was incredible--a fitting good-bye from the prairie as we departed for our new desert home. 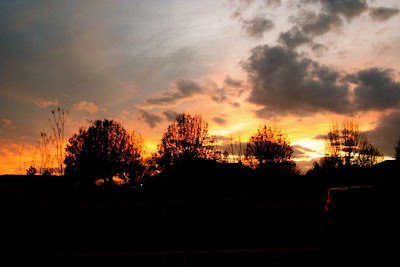 For wonderful skies from all over the world, be sure to visit Skywatch Friday. 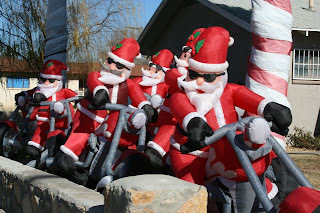 Are you all ready for Christmas? We haven't even begun to decorate. I am still working on clearing out a few last boxes that are stored in the guest room so we will be ready for some friends who are coming for a visit during the week before Christmas. Oops, next week! Today I think we will go to Enchanted Gardens, a nursery/florist shop housed in an old house that is supposed to have some great Christmas decorations and a nice feel to it. 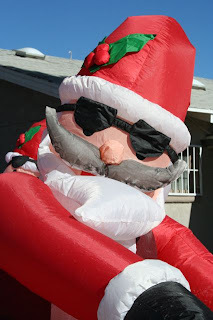 We need to get into the holiday mood! We are really having a lot of fun here. 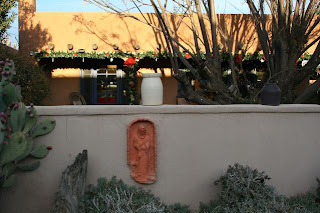 On Saturday, I went with Beez and Bucksnort to breakfast--huevos rancheros--at the Mesilla Valley Kitchen. Later in the day we drove down to La Viña Winery to taste and buy some nice wine, then to Stahmann Farms to get some pecans. 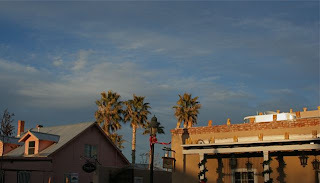 On the way back we stopped in Old Mesilla to sit in the plaza and watch the Christmas lights come on, just as Mass was getting out at the old church. We didn't need to get too many pecans at Stahmann's, because every time there is a little wind, lots of pecans fall into our yard from the surrounding trees! We found out that the harvest hasn't taken place yet, so we can look forward to watching that right from our patio. 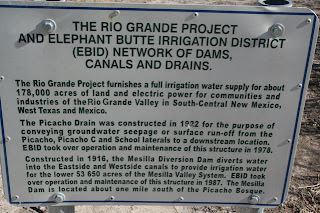 Bucksnort and I visited the new Mesilla Valley Bosque State Park for the first time last week and I am going to get us an annual pass so we can go back often. 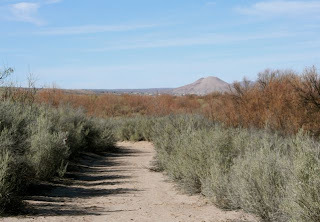 It's a great place for hiking and birding, as it is located along the Rio Grande and has lots of wetlands, a real draw in this desert place. We find that we are outdoors practically all the time here, walking and exploring. I'll be sharing lots of photos from all of these places over the next week or so. 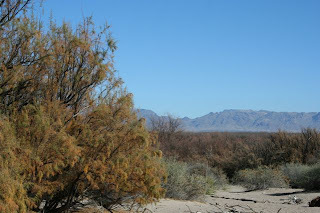 Here are some more photos taken on walks around our new neighborhood, just outside Las Cruces, New Mexico. 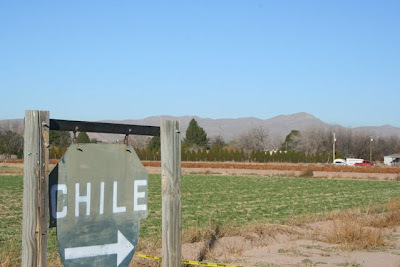 We are so pleased to be so close to a source of fresh chile. We smelled the roasters when we first visited the house. 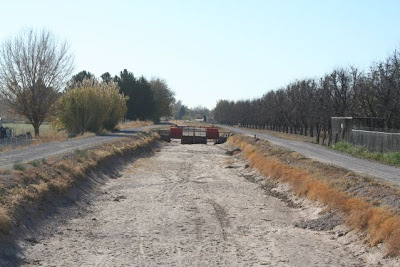 A view of "the ditch." I'll have some photos of it full of water in the spring. I love the plants and trees here! 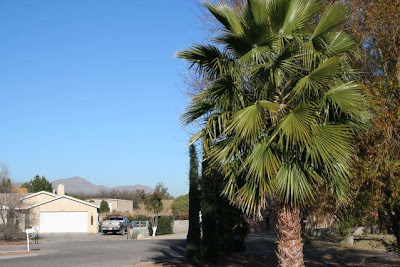 From our new house just outside Las Cruces, New Mexico, we look up at the Organ Mountains to the east; but we can see Picacho Peak through the pecan groves to the west. 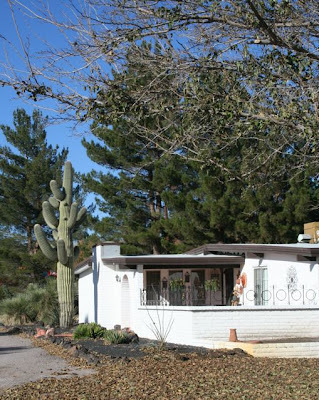 "Picacho" means "peak" in Spanish; so we are really calling this little (4959 ft.) mountain "Peak Peak." This shot was taken at our fence, looking through one of the groves that surround our home. 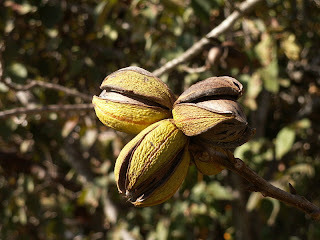 These last few days have been very windy, so every time we walk out into the yard there are more pecans to be harvested from the wind-blown pods that fly over the fence. 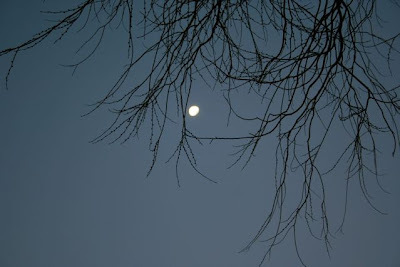 For sky photos taken at all times, day and night, see Skywatch Friday. There are over 350 participants, and you will see some breathtaking photos, indeed. Thank you to hosts Klaus, Sandy, Wren, Fishing Guy, Louise, and Sylvia, who do a terrific job every week! No, I am NOT available for lunch! I've been doing a little research on coyotes, because this is the perfect area for them. There are lots of trees and lots of pecans on the ground, and therefore lots of tree and ground squirrels, which I imagine make delicious meals for hungry coyotes. We've heard the coyotes twice now at night, howling away. Back east, I was told that a coyote (or pack) will work its way around its hunting range every three days or so. Or was it every week or so? I wish I could remember. We first heard them last Tuesday night, and then again on the following Sunday night. We will keep track to see how often we are aware of their presence. Of course, they could be right here all the time, I suppose, and not just roaming through. 1. 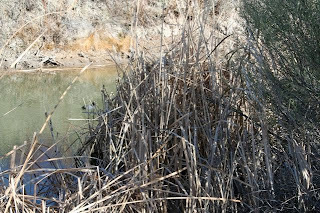 At the Bosque del Apache, near Socorro, NM, we watched a family of coyotes stalking and leaping on mice in a field during the forenoon. We were some distance away and watched through binoculars. 2. At our home in New Hampshire in the late afternoon, I looked out the window over the kitchen sink and saw a huge animal (more wolf-sized) emerge from the woods at the edge of a field; move like a cat toward its prey; leap; grab the cat-sized animal by the back of the neck and give it one strong shake. That apparently broke its neck and it hung limply from the jaws of the coyote/wolf, which trotted back in the woods with it. We later realized that the prey must have been a woodchuck, as there was a burrow nearby at that end of the field. The whole incident took place very quickly and was done very efficiently, and it reminded me of a housewife looking over a display of meat in a supermarket, reaching out and making her choice, then picking it up and putting it into her grocery basket and rolling it away. It was done just about that fast. 3. I saw a much smaller and rather ill-looking coyote eating from a deer carcass on the side of the road in the same New Hampshire town. This was during mid-afternoon, and was during a time when rabies was working its way through the local wild animal population. I wondered at the time if that was what was making the coyote look so sick and also if that was why he was out during the daytime. 4. I watched a small and very brazen coyote walk along the backyard walls in the development where my mother lived outside San Diego, just before our dinner hour. My mom said that there weren't any outside cats left in the neighborhood, as the coyotes had gotten them all. So, I have a couple of questions for you. What do you know about coyote hunting habits in your area? 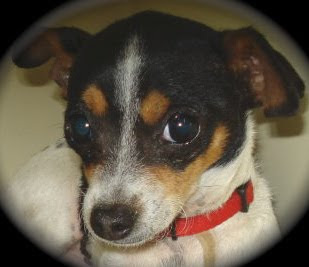 Do you have advice on keeping pets safe? I am forever compiling little databases of book series by date of publication so that I can read about my favorite characters in chronological order. Just now I discovered that there is an online wiki that you can use and add to that does the same thing, but in a much broader and more spectacular way because so many people can contribute to it. You may already know about this database, but just in case you don't, please check out The Internet Book Database of Fiction. It's a place to discuss your favorite books and to find more that you would like to read. Of great interest to me, of course, is the Series List, but there are many other ways to explore books (by author, genre, etc.). We had some rare cloudy skies and rain this past week here at my new home in Las Cruces, New Mexico. 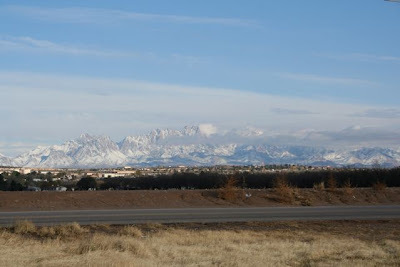 On the afternoon of the third day, the clouds cleared and the Organ Mountains were visible again with a new coat of fresh snow. At dusk, the magic show really started. 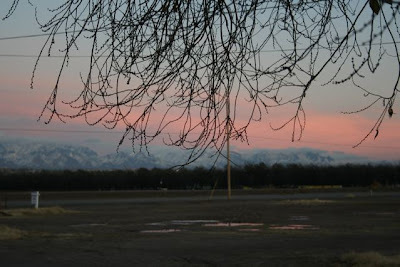 The sky, and then the mountains, turned pink. Cars began to stop along the roadsides so that their drivers could snap cell phone photos. I kept thinking--people come here for the view, and I LIVE here. 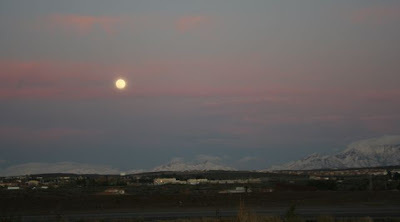 To make the evening even more special, a full moon rose over the beautiful mountains. As always, I wish I had the photographic skills to convey the scene more clearly to you, but this photo, together with your imagination, will have to do! To see skies over all kinds of land and sea, be sure to visit Skywatch Friday. 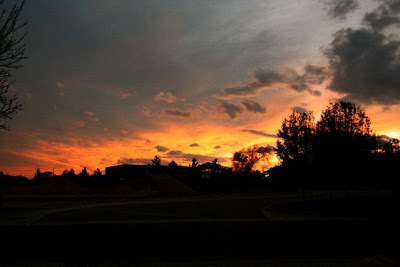 It is hosted by Klaus, Sandy, Wren, Fishing Guy, Louise, and Sylvia, who all do a terrific job of bringing you the sky photography of more than 350 website owners from all over the world.